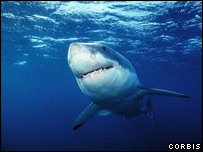 A system of permits will now control trade in great white shark products, a UN conference in Bangkok has decided. The Convention on International Trade in Endangered Species (Cites) has put the shark on its so-called Appendix II list, which demands tighter regulations. Conservationists welcomed the move, which was passed at the behest of both Australia and Madagascar. Beynon, of Humane Society International. "Now we have an opportunity to ensure trade in great white body parts is regulated sustainably." In their proposal, Australia and Madagascar argued that a higher listing for the great white shark "would help ensure that exploitation of the globally threatened species is regulated and monitored". Great white sharks are targeted commercially and by recreational fishermen for their valuable jaws and teeth. Their fins, like those of other sharks, are in high demand for soup. Appendix III: Contains 290 species that are protected in at least one country. Accurate great white numbers are not known, but scientists say available data suggests the population is in decline. "I'm thankful that the international community recognises this species for what it really is - a perfectly adapted oceanic predator and a key player in many of the world's marine ecosystems," said Dr Ramón Bonfil of the Wildlife Conservation Society. "In spite of its reputed ferocity, this species is ironically a victim of what is undoubtedly the planet's most deadly species - humans," he continued. "This listing will help us manage the trade that currently threatens the great white shark by requiring data that harvests are not a detriment to the species." The great white already had an Appendix III listing. It has now become only the third shark to be afforded Appendix II protection under Cites, joining the far larger but gentle basking and whale sharks. The Swiss-based World Conservation Union's "Red List" - a respected wildlife guideline widely used by scientists and conservationists - classifies 82 sharks and rays as threatened. Another 10 are expected to be added soon. In a separate development, Japan's proposal to hunt minke whales commercially has been rejected by Cites. The convention currently gives minkes an Appendix I listing, which bans all trade; Japan had sought a relegation to Appendix II. But the proposal fell well short of the support it needed for adoption, with a majority of the 166 Cites delegates voting against the motion in Bangkok. The move preserves an 18-year-long moratorium on commercial whaling. The down-listing of the minke to Appendix II would not have superseded the ban administered by the International Whaling Commission (IWC), but commentators say it would have put pressure on that body to ease the prohibition at some future date. There are more than one million minke whales worldwide, according to data presented to Cites, and Japan argued that their numbers were now at a level that could withstand limited harvesting. But conservationists had vowed to block the plan. "Major uncertainty remains over population trends of the minke whale, and permitting trade in whale meat through Cites would have been a challenge to the authority of the IWC," said WWF delegation leader Susan Lieberman. "We are tired of the Japanese trying to re-establish whaling through the back door." 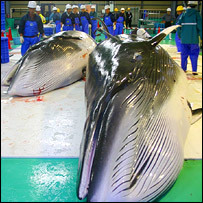 However, the Japanese delegation said it would continue pushing for a resumption of commercial whaling. "The West is trying to impose its unilateral standards on us. I regard this as cultural imperialism," Japanese delegate Masayuki Komatsu said. "We will continue to propose a down-listing." Eugene Lapointe, president of IWMC World Conservation Trust, which campaigns for the sustainable use of wildlife as a means of protecting biodiversity, agrees the minke whale should not be included on Appendix I. "This outcome makes a mockery of international regulations for conservation," he said. "Appendix I is supposed to list species that would be endangered by international trade, not those that look good in the publicity material of animal rights groups. "Minke whales are plentiful, the evidence for their abundance is incontrovertible and there is even a concern that their burgeoning populations may be preventing the recovery of other species, such as the blue whale." Commercial exploitation of whales in the early part of the 20th Century had caused many whale populations to plummet. Since the IWC moratorium was imposed in 1986, species have been on the rebound (some more than others). Having seen its minke proposal lost, Japan was then critical of the decision to up-list the great white. "No global population assessment of this species has been carried out," Japanese delegate Masayuki Komatsu told the Cites meeting. A large majority of the delegates disagreed, however; and they also went on to approve regulating the trade in humphead wrasse, a distinctive coral reef fish that lives in the Indo-Pacific. It can grow to a hefty 2m in length. Its rarity, and the fact that it is a prized delicacy, means the creature can retail at around US$130/kg, making it one of the most valuable fish in the live reef fish trade. It will now have an Appendix II listing like the great white. The signatories to the convention are meeting in the Thai capital for their 12-day biennial summit which ends on Thursday.